The Microfinance industry is gathering momentum to become a significant force in India. The number of self-help groups (SHGs) savings linked has increased to about 7.5 million with a member base of 98.1 million. The SHG bank linkage program (SBLP) has shown a active borrowings from banks with the growth of 4.9% in the number of SHGs. The institutional credit outstanding against the SHGs as at end of March, 2011 exceeded INR 32,000 crore – an experiment which has no parallel elsewhere in the world. The average loan for a SHG member in 2010 -11, stood around INR 4,900 as compared to INR 4,570 in 2009-10. The microfinance model has evolved over the years and is designed to assist the lower income group to overcome the challenges in the society with respect to illiteracy, financial assistance etc. 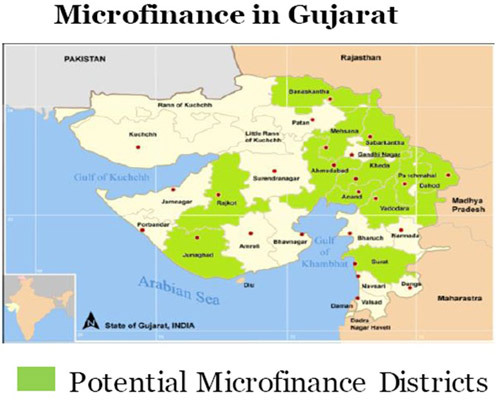 Gujarat has been considered as a huge potential market in terms of microfinance. The maximum number of potential SHGs are found in Panchmahal, Banaskantha and Sabarkantha. During 2010–11, 16 states had a positive growth rate and 11 states had a negative growth rate in client outreach. The client outreach recorded highest (1.6 million) in Uttar Pradesh, followed by Gujarat (1.53 million). However Gujarat had the highest growth in portfolio at ~10.8 billion followed by Uttar Pradesh at ~6.3. Microfinance is one of the major verticals of GLPC. Under this vertical, GLPC primarily aims at the credit linkage of the SHGs with banks. In a one of its kind initiative, GLPC had launched an aggressive microfinance campaign to credit link all eligible SHGs in the state of Gujarat with banks. GLPC also aims at provision of financial instruments to the marginalized and deprived sections of the society. During the Vibrant Gujarat Summit 2011, GLPC had entered into anMoU with State Level Banker’s Committee for provision of a minimum Cash Credit amount of INR 50,000 to all the eligible SakhiMandals/SHGs in the State of Gujarat. To implement this MoU, GLPC, RBI, NABARD and Bankers jointly deliberated and finalized new guidelines for Credit Linkage of SakhiMandals /SHGs. With this initiative, 1.7 lakh applications out of the eligible 2.5 SHGs have been sponsored to different Banks. A total amount of INR 1,100 crore has been sanctioned as cash credit to SakhiMandals/ SHGs in Gujarat. The average amount of sanctioned credit to each SakhiMandal/ SHG stood approximately INR 75,000.